The moment I woke up this morning and looked outside my window, I knew I wanted a cup of hot Indian masala chai. It’s raining, cold and grey and there is nothing like a cup of hot masala chai to warm you up. It might seem like just a cup of tea but for me rain and tea brings back very fond memories of home in India. Tea is one of the most popular beverage in India. Any time it rains heavily and cools down, people gravitate towards a hot cup of masala chai with freshly fried hot pakoras or samosas. 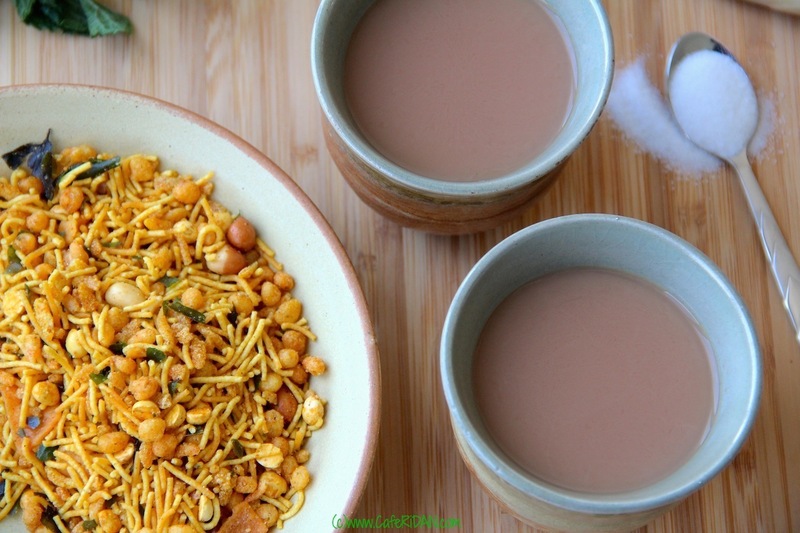 Masala chai is basically black tea with milk. What makes it special is the addition or spices or masala with different flavor profiles. 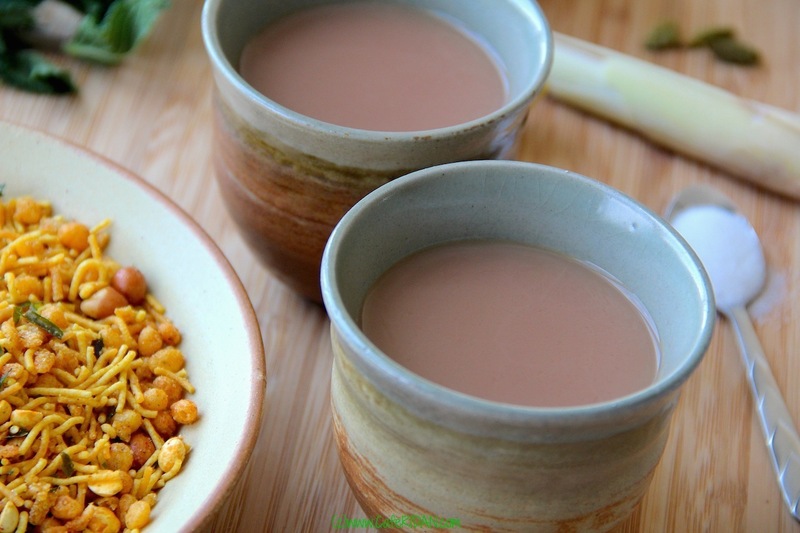 Indian masala chai has become very popular here in the US as Chai Tea Latte. 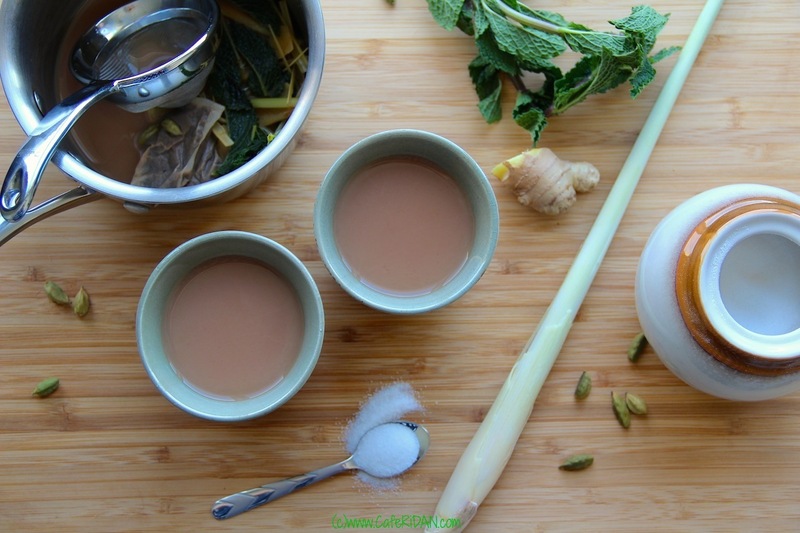 To make this tea I boil the water with lemongrass, ginger, mint and cardamom. Lemongrass is a plant that has a flavor profile that is very similar to lemon. It is citrusy but it tastes almost like a mix between lemon and mint. Ginger is spicy, slightly sweet, warm and has a pungent aroma. Mint leaves add a fresh and aromatic flavor. Cardamom pods of course add amazing warmth to the tea. You can use any brand of black tea that you like. I have tried many different brands of black tea but my favorite is PG Tips. You can use the tea bags or loose-leaf tea. They both work really well. Add water, mint leaves, lemon grass, ginger and cardamom pods to a medium saucepan. Cover and bring to a boil. Turn the heat to low and allow the water to boil for another 5-7 minutes. Bring the heat back up to medium and add milk and teabags. Boil for a minute. Take it off the heat, cover and let it steep for a couple of minutes. Strain into teacups, add sugar as per your taste and enjoy hot. coverage! Keep up the fantastic works guys I’ve included you guys to my own blogroll.